THIS EASY CHICKEN AND DUMPLINGS RECIPE IS A MAKE AT HOME FAVORITE I INHERITED FROM MY GRANDMA! In a small measuring cup, measure out the milk for dumplings and stir in 1 tablespoon apple cider vinegar. Let sit until ready to use. In a large pot, pour in olive oil, carrots, onions and seasonings. Cook over medium heat until onions are translucent. Add chicken, peas and broth. Bring to a low simmer. While soup is coming to a low simmer, make the dumplings. In a large bowl, mix together biscuit mix and soured milk. Mix until it forms a ball. Generously flour a clean surface and turn the dough out and form a round disc. Roll out until ½ inch thick. Use a pizza cutter to cut into strips. Then cut the strips into thirds. 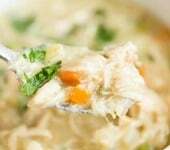 When the soup comes to a boil, stir in cream of chicken and cream of celery soup. Gently add the dumplings to the pot and gently stir. Let simmer for 5-7 minutes until the dumplings have cooked through. Let cool slightly and garnish with fresh parsley. FOR THE CHICKEN: Place 6 large chicken breasts in a crockpot. Season generously with salt, pepper, onion powder and garlic powder. Thickly slice 1 sweet onion and place rings over the top of the chicken. Pour in ½ cup water or chicken broth. Cook on low for 3-4 hours. When done, shred the chicken to use in various meals. (I used half for the dumplings and will use the rest for enchiladas). FOR THE DUMPLINGS: 2 1/3 cup biscuit mix, ¾ cup milk, 1 tablespoon apple cider vinegar.